“The Church of England faces two years of revelations about sexual abuse and cover-ups, a bishop has said. The Church will be the focus of hearings at the Independent Inquiry into Child Sexual Abuse next month. Several bishops joined a silent protest by abuse survivors outside the synod. Among them were the Archbishop of Canterbury, Justin Welby, and the Archbishop of York, John Sentamu and other supporters off the victims. 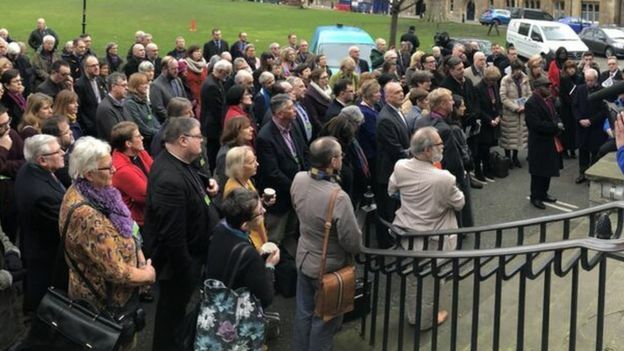 Despite this show of support, one of the protesters, Gilo, told the BBC that the Church was “failing” to set a good example in the way it handled complaints. 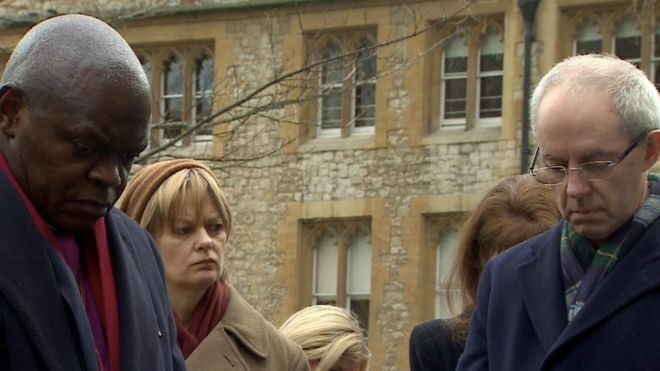 Many survivors believed the national safeguarding team needed “total root and branch reform”, he said. In 2016, the Church of England was dealing with about 3,300 safeguarding concerns, a figure which includes historical allegations and non-sexual abuse. Bishop Hancock, the lead bishop for safeguarding, told the synod that “this will not be an easy couple of years”. “We will, as our friends in the Anglican Church in Australia did, feel a deep sense of shame,” he said. A royal commission last year revealed more than 1,100 allegations of child sexual abuse in the Anglican Church in Australia over 35 years. The Church admitted it tried to silence victims to protect its reputation. Sir Roger Singleton, a member of the Church’s national safeguarding team, told the synod that there was a need for a culture change, with some clergy believing complainants were “simply out for the money”. He said that while archbishops, diocesan bishops and deans had made safety a priority, the attitudes of parish clergy and laity were “variable”. “I believe a tipping point has been reached where most clergy are informed, supportive of their parish (safeguarding) representatives… and willing to tackle reluctant church wardens or PCCs. Sir Roger said he was “fundamentally optimistic” that the necessary cultural change would happen. The synod also unanimously backed a motion calling on the government to provide “comprehensive, unbiased information” about Down’s Syndrome for parents who are told their unborn child has the condition. The Bishop of Carlisle, the Right Reverend James Newcome, said the debate was not about the ethics of abortion, although there were fears that abortion rates for those diagnosed with Down’s Syndrome could rise now it can be detected with a non-invasive test.